Every soccer culture has a defining characteristic. Watching more than 50 hours of USMNT game tape reveals what makes the U.S. men’s national team unique. 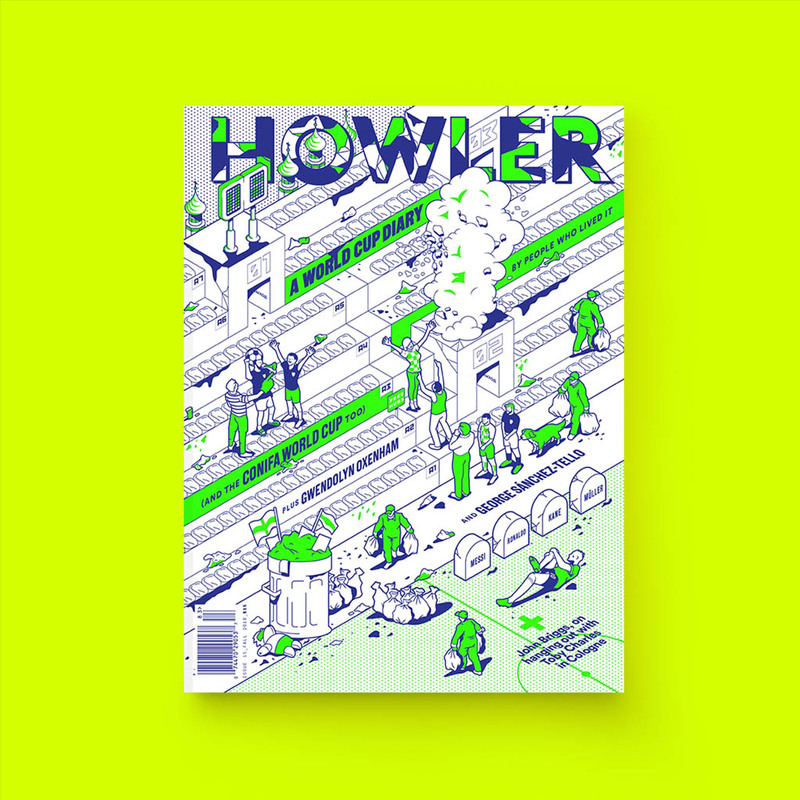 This story from our debut issue (Fall 2012) has become a Howler classic—one of the top two or three stories people mention if they’ve been reading the mag for a while. 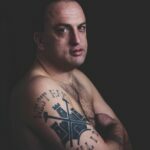 We asked Matthew Doyle (MLSsoccer.com’s Armchair Analyst) to watch more than 50 hours of USMNT tape (going all the way back to Italia ’90) and then tell us what — if anything — characterizes the American style of play. No one expected the U.S. to win the World Cup in 1990. It had been 40 years since the Yanks had last qualified, and the global soccer media treated the team more as a curiosity than a contender. It was a fair assessment: They were something of a curiosity, and definitely not contenders. 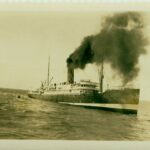 The North American Soccer League had folded six years prior, leaving the players who would represent the U.S. without a league or much in the way of proper training. If the players had inherited anything from the previous generation of American pros, it was the ability to play an AstroTurf hop correctly — and not much more. That is what head coach Bob Gansler was working with, and the gap between the U.S. amateurs and their professional opponents was on display almost immediately. In the first group game the Czechoslovakians showed the Americans, who were lined up in a somewhat naïve 3–4–3, just how far behind the rest of the world they were. Quick hits off of turnovers led to the first two goals. A poorly defended corner kick caused the third. Mike Windischmann, the U.S. sweeper who was so reliable against CONCACAF foes, labored a half-step behind the play every time the Czechs surged forward. They were relentless. It didn’t matter what formation the Czechs were playing (for the record: basically a 1–3–4–2), they were always able to find space against the Yanks. The match ended 5–1, a blindingly ruthless execution. Curiosity gave way to pity. 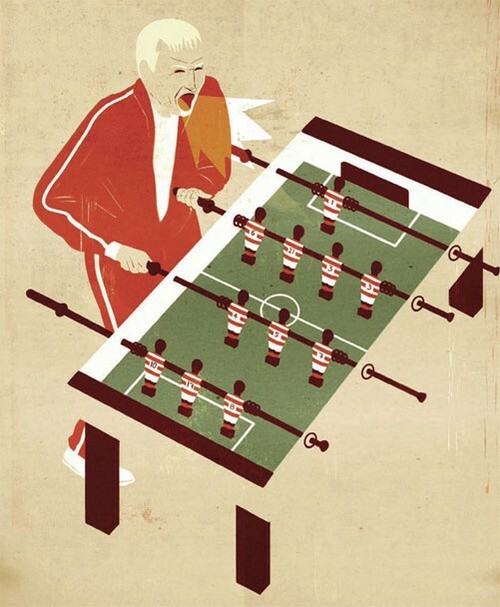 Soccer tactics are often discussed in terms of national style. The Italians have theircatenaccio, the Spanish their tiki-taka. Both developed out of defensive need — catenaccio is famously considered “the right of the weak” to destroy the game and make it unplayable by locking down the defense. Tika-taka’s short passes came about because Luis Aragones realized that his team of magicians was unbeatable with the ball, but far too easily breeched without it. Reductionism of this sort can be dangerous — no Italian team of note has actually played catenaccio for decades, and in Holland “Total Football” is a relic of another age. But it can be useful too, especially when applied to a simple game that is often over-complicated by clever minds. A neutral observer of the last 22 years could be forgiven for assuming that the American style — to the extent one exists at all — is “try hard, run fast,” and don’t spend too much time thinking about tactics. That’s what happens when you have players whose athleticism (with rare exceptions) exceeds their technical ability. But unsexy as it sounds compared to, say, “Total Football,” U.S. national team players did (and do), habitually try hard and run fast. They eagerly compress space. They work in groups defensively and love to break forward. It’s a style that hasn’t inspired poetry, but as they said in Rome, Quod facis bene fac. Even during their evisceration at the hands of the Czechs on that summer day in Florence, the 1990 team provided a classic example of this — and a small glimmer of hope for the future of the program. Just after Eric Wynalda was sent off for a reckless challenge in the 52nd minute, midfielder Paul Caligiuri intercepted a lazy midfield switch. He one-timed a pass to center forward Bruce Murray — who’d peeled off the backline to act as a fulcrum — and buzzed into space to receive the perfect return ball, then dribbled around keeper Jan Stejskal to make it 3–1. The goal is memorable for the individual brilliance Caligiuri showed on the play, and also for the way it informed the following 22 years of U.S. strategy: Stay compact, force turnovers, and hit as hard as you can on the counter. Much has changed since 1990, but this is still — for now, at least — the beating heart of U.S. soccer. Of course, that day against the Czechs was more about hard lessons than glimmers of hope. 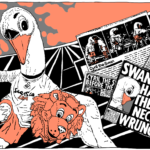 Gansler and his “galumphing side of corn-fed college boys,” in the words of English journalist Brian Glanville, had been well and truly schooled. To seriously compete with the rest of the world, the Americans would need to stop just playing the game. They needed to start thinking it. After Italia, with the first stateside World Cup just around the corner, the U.S. didn’t have time for decades of slow, organic tactical development. The USSF needed a fast solution, and they found it in Bora Milutinovic. Born and raised in the former Yugoslavia, Milutinovic had played in Belgrade, Monaco, and Zurich. He married a Mexican woman, and coached there. And in Italy. And Costa Rica. Milutinovic was a citizen of the soccer world, a one-man petri dish of tactical nous. Most important for the evolving American style, he understood that tactics are only useful if players are capable of employing them. And so he went about finding players who’d do what he wanted — refuse to get stretched, defend in groups, and hit on the run. He built his team around rugged central defenders Marcelo Balboa and Alexi Lalas, box-to-box midfielder Thomas Dooley and fleet-footed attackers like Wynalda, Earnie Stewart, and Cobi Jones. By the end of 1992, Bora had his players and “Bora Ball” began to take shape. 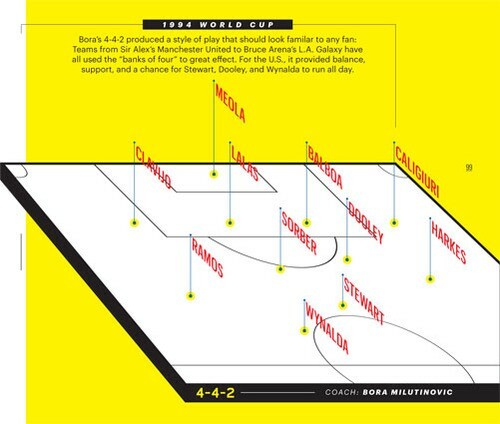 Milutinovic did away with wingbacks, the sweeper — none of Bora’s boys would ever be exposed as Windischmann had — and all other vestiges of the 3–5–2 in favor of a more compact, modern 4–4–2. D-mid Mike Sorber would stay deep while Dooley went box-to-box. John Harkes and Tab Ramos, the classy Uruguay-born playmaker, manned the flanks. Defensively, everything would be done in groups, and all attacking would be at pace. Bora’s players would understand what they could do — and what they couldn’t — and play to their strengths. They were still corn-fed college boys, most of them, but now they carried themselves and defended like pros. After opening USA ’94 with an unremarkable 1–1 draw against Switzerland, a match against pre-tournament darlings Colombia showed exactly what Bora Ball could accomplish. The Colombians, fancied by many to go at least as far as the semifinals, were smothered by the Americans, unable to find the seams that had shown themselves so easily in CONMEBOL play. Balboa and Lalas kept their line deep while Sorber spent his day inside Carlos Valderrama’s shirt. With Colombia’s playmaker largely out of the mix, they had no creative push. As the Colombians succumbed to frustration and defensive indiscipline, chasing the ball instead of closing space, a U.S. goal became inevitable. Eventually defender Andres Escobar, at a full sprint trying to keep up with play, turned Harkes’ cross into his own net for the 1–0 U.S. lead. Stewart made it 2–0 on the other side of halftime after a brilliant ball into space from Ramos. Lalas also had a screamer of a goal off a set piece that was wrongly ruled offside. It finished 2–1, but that score flattered Colombia. Milutinovic had taken the weaknesses of the 1990 team — reckless enthusiasm pushing forward and an inability to cope with multiple runners in the back — and turned them into strengths. Their reward was a chance to make history in the Round of 16 against mighty Brazil. Tactically, there was little to separate the two teams: Today we’d call it “banks of four versus banks of four.” But the Samba Kings did something the U.S. hadn’t seen previously. They pressed. This wasn’t the aimless desperation of the Colombians but a scripted, thoughtful swarm. No matter where the U.S. had the ball, no matter who had it, yellow shirts were there. Four years of preparation were not enough; it would have taken a lifetime with the ball, and with teammates who knew what to do with and without it, to be comfortable against a team as ferocious as Brazil was that summer. Ninety, 100 yards from goal — it didn’t matter, the Brazilians were coming. They were going to feast off mistakes, punishing whoever dared do anything but punt it out of the back. So punting it out of the back was exactly what Bora’s boys did. Even after Leonardo was sent off for fracturing Ramos’ skull, the Brazilian pressure was unyielding. There was nothing else to do against that pressure, especially without Ramos. In the end it was a turnover that did the U.S. in, with Romario and Bebeto combining on a lightning-quick counterattack. There was still plenty of time left — 18 minutes — but the game was effectively over. At the final whistle, Lalas dropped to his hands and knees, chest heaving. He was out of gas. They were all out of gas. Against pressure that high and that hard, the Americans had no answers. Brazil showed that the “run fast and try hard” ethos wasn’t just for teams trying to make up for a lack of skill. They had been every bit as fast and fit as the Americans were. They simply added superior technique and discipline to the mix. Getting to that level, one way or another, has been the goal of the U.S. ever since. Bora was sacked in early 1995 after “discipline” had turned into “ultra-defensive drudgery.” It was tacitly understood that his replacement, the well-liked U.S. assistant Steve Sampson, was to field a side built to go on the attack early, often, and without regard for the pedigree of the opposition. Sampson was seen as something of an attacking guru, having built tiny Santa Clara into a college powerhouse. It started well. Sampson’s squad, maintaining the discipline Milutinovic had instilled, beat Nigeria and Mexico 3–2 and 4–0 in consecutive games at the 1995 U.S. Cup. After a scoreless draw with Colombia, Chile was the next victim, going down 2–1 in the first game of the 1995 Copa América. Next up was Argentina, and miraculously they went down even harder: 3–0. Suddenly, the U.S. was a juggernaut. While the 3–0 scoreline caught the eye, there was something else about that Argentina win many had not noticed: The Yanks had lined up in a 3–6–1. The formation leapt solely from Sampson’s imagination, the first (and to date, only) truly revolutionary tactical innovation to come from American soccer. The idea was to have two holding midfielders who’d alternate their sojourns forward, two playmakers in front of them always looking to attack, and two wing backs who’d bomb up and down the touchlines at pace. Add in Wynalda, who was always more comfortable drifting into space than playing with his back to the goal, and the U.S. could send six or seven guys sprinting at the goal the moment the ball turned over. It worked so well against Argentina that Sampson decided to keep it a secret for the next three years — until just before the ’98 World Cup. 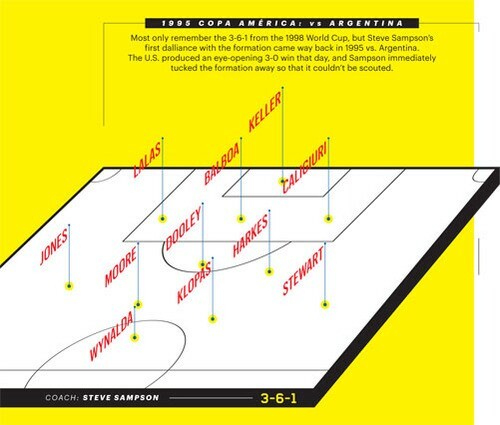 Sampson’s 3–6–1 was built to take advantage of the talents of Claudio Reyna, perhaps the most polarizing player in U.S. history. Reyna was supposed to be the second coming of Ramos, a schoolboy hero in New Jersey with sweet South American skills who lived to make the last pass. He never did turn into Ramos, though; he ended up being more of a string-puller than a table-setter, a timekeeper who spread the ball around the midfield and made it easier for others to attack rather than do so himself. Managers, aficionados, and fellow players lauded him because of his ability to do the “little things” — keeping possession in traffic, switching play into stride instead of into feet, recovering the second ball. Fans, however, tended to notice what wasn’t there. Reyna didn’t produce a lot of goals, either for himself or — directly, anyway — for others. But his comfort in traffic made Sampson’s side very, very difficult to press. For a team that had always been out-skilled by the “big” teams (think Brazil ’94), he was a one-man solution. Run two guys at him and he’d almost always turn out of it and hit a pressure-releasing pass to the flanks. His skill in that area allowed others to get the ball in space, on the run, numbers up — which was the point of the 3–6–1, after all. But Sampson miscalculated: Reyna was too young to lead the team, and too risk-averse to run an offense. The U.S. would find out the hard way at France ’98. Following an up-and-down qualifying campaign, “captain for life” John Harkes was dropped outright after an alleged liaison with Wynalda’s wife (which Wynalda would confirm more than a decade later). Dooley was moved from midfield to sweeper, and Lalas and Balboa were benched in favor of Eddie Pope, and — eventually — Frenchman David Régis. The changes shook the locker room. Sampson gave the U.S. players the freedom to express themselves, which was badly needed after the staid Bora Years, but he’d failed to rein in egos or build trust and camaraderie. So when the U.S. went out against Germany in the first group game and fell on its face, losing 2–0, nobody was surprised. Nobody except Sampson, who was so shaken that he reverted to a 3–5–2 for the next contest against Iran. It was the right move — the U.S. played better with Brian McBride as a target forward, channeling the offense through him — but Iran won 2–1. A 1–0 loss to Yugoslavia in the third group game secured an ignominious 32nd-place finish. With Sampson, the thinking game had given way to overthinking. It’s a stop on the journey for every soccer country (even Brazil had their Götterdämerung back in 1950). A clever mind had made a simple game harder than it needed to be. After France, the USSF found itself in a familiar situation. It needed a coach who could instill the belief that had been shattered at the World Cup. It needed a coach who fairly reeked of confidence. It needed Bruce Arena. Arena had already made a name for himself in MLS and CONCACAF, guiding D.C. United to a pair of international titles in 1998 — the CONCACAF Champions Cup and the Copa Interamericana — as well as steering the 1996 U.S. Olympic team to a respectable showing in Atlanta. During his time at United (and, previously, at the University of Virginia and the U-23s), Arena coached Reyna, Pope, and Frankie Hejduk — the one break-out performer at France ’98 — and dozens of others who’d play for him over the next eight years. He knew what he had and how to use it. By installing Chris Armas as a dedicated ball-winner, Arena gave Reyna freedom to go forward, providing him with a bodyguard. (German playmaker Andreas Möller once said of Armas: “No man with children should have to play against him.”) Meanwhile, McBride had evolved into a world-class target man. These were the linchpins of Arena’s best teams, the guys who could give the U.S. a level of flexibility as different situations arose. Armas (and later Pablo Mastroeni) could always shield the defense. Reyna could dampen or quicken the tempo if needed. And even against the most hellacious press, McBride could be counted upon to create two or three good chances a game by holding the ball up then playing it into space for midfield runners. The final pin fell when Landon Donovan came of age. The 1999 U-17 World Cup Golden Ball winner was the fastest player on the team. He had the best vision. He could cross the ball with either foot and was comfortable playing wide, leading the line, dropping into the hole, or staying just off McBride’s shoulder. Arena would later say, “The problem with Landon is that he’s your best player at so many positions that you never know where to put him.” So he never really put Donovan anywhere. Donovan became the heir to Stewart as a do-everything attacker who’d stretch the field offensively, track back defensively, never waste possession, and just find a way to turn up in important spots on the pitch. With Reyna as the focal point of possession, McBride the attacking hub and Donovan ready to play the sidekick to either at a moment’s notice, the U.S. could shift from reactive to proactive with the flip of a switch against all but the very best opponents. It was a level of flexibility Bora never had and Sampson never knew he needed. Even so, the Americans had to ride their luck in the group stage at the 2002 World Cup. Arena put out a conservative 4–4–2 against Portugal and then watched as his team fairly eviscerated A Selecção for 45 minutes, then gamely held on for a 3–2 win. Against co-hosts South Korea, the U.S. faced pressing unseen since Brazil in ’94, but coped with it for a flattering 1–1 draw. After dropping their third game 3–1 to Poland, the Americans advanced to face Mexico in the Round of 16 thanks only to a late Park Ji-Sung goal against Portugal, saving them from the fickle god of goal differential. Though the U.S. had made some progress against Mexico over the seven years leading up to that game, El Tri was favored. They were simply so much more comfortable with the ball that the thought was they’d pass the U.S. to death. Arena was content to let them try. His master stroke was scrapping the 4–4–2 for a 3–5–2, which the U.S. hadn’t used in more than a year by that point. What’s more, Reyna was at right wing back, so by design the U.S. would rarely have the ball. Arena wanted those midfield turnovers so they could play direct, ruthless soccer, just as the Czechs had done to Gansler’s side 12 years prior. McBride opened the scoring after only 8 minutes, finishing from the middle of the 18 after some wonderful work by Reyna and forward Josh Wolff. He could hardly have missed, though, as there was no green shirt within five yards of him. Defensive midfielder Gerardo Torrado should have been in that spot; instead, he was at the back post, one of three men marking Donovan, who’d ghosted there on a decoy run. Thanks to Arena’s tactical switch, nobody on Mexico knew who was supposed to be where. Mexican head coach Javier Aguirre panicked and made a switch of his own, opting for a disjointed 3–4–3, a change that had the rather comical effect of limiting the Mexican attack to a series of crosses against the overpowering U.S. defense. The Yanks added a second at 65 minutes when, after a perfect counter attack, Donovan headed home at the back post — with Torrado, as always, trailing in his wake. It ended 2–0, a perfect exhibition of reactive football culled directly from the chapter written in Florence. In 12 years, the U.S. had gone from a curiosity to World Cup quarterfinalists. They’d gotten there by running fast and trying hard, yes, but also by making sure that whatever it was they were doing on the day, that they executed it well. It wasn’t just anyone they’d face in the quarterfinals: It was Germany. As any sane coach would, Arena put out a more defensive-minded XI, which, much to the amazement of fans and press alike, led to a more cohesive, proactive attack. Hejduk was inserted at right wingback while Donovan shifted up top and Reyna returned to his central role. It was a 3–5–2, but a sturdier one. The match proved Reyna’s finest hour. The captain found space all over the midfield, pulling the strings and occupying as many as three players at a time from Germany’s 3–4–1–2. This was the player Johan Cryuff had wanted for Barcelona 10 years previous, a №8 with perfect touch on the ball, patience and the vision to put a pass into space when the seas parted. Donovan was able to break past the German backline with ease. McBride found acres. Hejduk bombed all the way to the touchline. Time and again, though, German goalkeeper Oliver Kahn got the best of the U.S. He kept it 0–0. And Germany, outgunned, was still Germany. More than any other team in the world, they knew what they did well and what they didn’t, and knew how to play to those strengths. So they buttoned up, played deep, and waited for set pieces. In the 39th minute they got one, and Michael Ballack headed home. Then began the grim, dirty job of holding on. That included a Torsten Frings handball on the line, with a penalty somehow not given, and a Reyna chip from midfield that went one yard wide of Kahn’s net. They should have, but they didn’t. Germany would advance with a 1–0 win, and the U.S. would go home. What it said about the overall U.S. style is tough to contextualize, since so much of it came down to the specific skills of Reyna, McBride, and Donovan, as well as help from the likes of Mastroeni, O’Brien, Tony Sanneh, and Clint Mathis. Harnessing all these individual talents and getting them all to buy into “run fast, try hard” regardless of formation was Arena’s best accomplishment and an important stop on the U.S. evolutionary process. In one game, against Mexico, they’d applied the lessons of the past. In the next, against Germany, they’d shown a fluidity in possession and attack that shined a light on the future. Keeping Arena on for another World Cup cycle was a no-brainer. He’d instilled much-needed confidence after the debacle in 1998, produced a memorable tournament run, developed a pair of young stars in Donovan and DaMarcus Beasley, and seemed to have all the pieces in place for a bigger, better run in 2006. There were problems, though: Reyna, McBride, Pope, and Hejduk were aging. O’Brien was always hurt. There was no third d-mid on the depth chart behind Mastroeni and Armas. And Donovan, much like Reyna in ’98, wasn’t ready to lead. When Germany 2006 rolled around, he was so far inside his own head that he couldn’t even shoot. play against anyone. But as the Yanks had learned in previous World Cups, winning on the biggest stage requires more than just the ability to stay compact. It’s about finding time and space to make game-changing plays, and having players with the confidence to make them. With Donovan in a funk and both Reyna and McBride out of gas — all three had run themselves into the ground vs. Italy — the U.S. simply didn’t have the answers. To compound things, Arena put Reyna at d-mid with Donovan ahead of him in an awkward 4–1–4–1, going wildly offense-minded in a must-win game against Ghana. There was no true d-mid on the team after Mastroeni, who’d seen red against Italy, so the U.S. midfield was overrun. After Reyna miscontrolled a Clint Dempsey backpass 22 minutes in, Draman Haminu opened the scoring for the Ghanaians. Reyna came off 18 minutes later, limping and clutching the knee that Haminu had smashed when dispossessing him. It was the final act of his national team career, and it would, to this day, change much about how the U.S. would and could play. Without Reyna, the U.S. couldn’t control the tempo. For all the advancements in tactical understanding the U.S. had made since 1994, much of the progress had come down to having Reyna in the middle to put a stamp on the game and offer flexibility that other managers simply didn’t have. Without him, the U.S. could only reliably go in one direction: forward. The match ended 2–1, and the U.S. went home. Arena paid the price, losing his job for more or less failing to put out a team that produced enough highlights. Whoever was to follow him had several things on the “to-do” list: Rebuild both the team’s confidence and Donovan’s; figure out how best to use Dempsey, who still had no real position and was prone to individualism; and replace the seemingly irreplaceable Reyna. USSF President Sunil Gulati’s first, best target to replace Arena was Germany’s Jürgen Klinsmann. Klinsmann’s young team had made it all the way to the semifinals in the 2006 World Cup, producing some of the tournament’s best soccer in the process. It wasn’t the jogo bonito of the Brazilians; instead it bore more resemblance to the great Dutch teams of the mid-to-late 1980s, a side with pace, power, and intelligence. But the USSF failed to woo him, so Gulati turned to former Arena lieutenant Bob Bradley as an interim head coach. And Bradley immediately started overhauling the roster. His approach was simple: Get guys who could run with Donovan, Dempsey, and Beasley. The U.S. was best in transition, so they’d open the game up as much as possible. The goal was to force teams into turnovers at the top of the box, then shuttle the ball sideways until it got on the foot of one of the fullbacks, who would carry it as high as possible until Donovan or Dempsey could show. Up top, Charlie Davies and Jozy Altidore worked out almost perfectly as a complementary striking partnership. Davies ran the channels while Altidore, always an underrated passer, checked to the ball. When they were able to create room, that meant more time and space for players bursting forth out of midfield. It took more than two years to come together, and throughout critics dismissed it as linear and uninspiring. But talk of that nature vanished after the 2009 Confederations Cup in South Africa. The final group stage game for the U.S., against Egypt, isn’t remembered as well as it should be, mostly because the following game (2–0 over the Spaniards) and the final vs. Brazil (a heartbreaking 3–2 loss in which Donovan tallied one of the best counterattack goals ever scored in a major final) cast such large shadows. 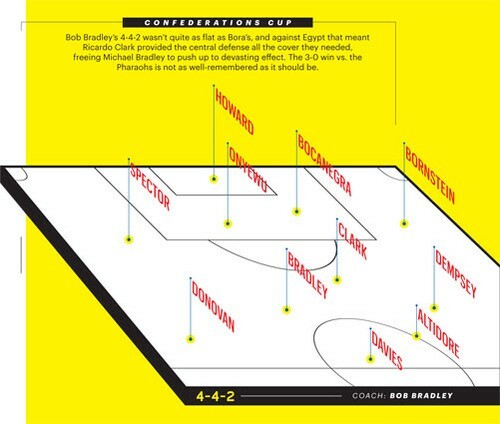 But it was the Egypt match, which wasn’t just a “must-win” but a “must-pummel-into-submission,” that showed how well Bradley’s group could perform when firing on all cylinders. Davies and Altidore were relentless in finding space, and when the U.S. pushed forward with numbers it was like an avalanche: “try hard, run fast” at its finest. The notion of controlling the tempo was never at issue: instead, they simply tried to push it as high and hard as it could possibly go. Two of the three goals (Dempsey and Michael Bradley) were scored at pace, and Egypt’s 3–0 humiliation reinforced scouting reports on the U.S. around the world: When they’re running, they’re dangerous. But at the World Cup in South Africa, doubts about Bradley’s coaching remained. Was he an astute tactician whose ability to make in-game adjustments won his team results, or was he myopic and stubborn to the point that he was forced into those adjustments out of desperation? Whatever the case, by shifting from an “empty bucket” 4–4–2 to a 4–1–3–1–1 after going down 2–0 to Slovenia in the second group game, Bradley unleashed Donovan to become a U.S. legend. Unshackled on the right flank, Donovan took control of the game. Minutes after the formation switch, he dummied a Slovenian central defender, took two touches and fired the ball directly at Samir Handanovic’s head to slice into the lead. It was a blast that seemed filled with all the angst and agitation of the previous four years, and it woke the U.S. up. Benny Feilhaber, a halftime sub, raised hell up and down the left flank, Altidore carved as wide a swathe as McBride ever had, and Michael Bradley did the running of three men. They didn’t quite reach the anarchic élan of the 2002 team against Germany but — finally — this was a U.S. team that could use the ball to both generate chances and snuff out opposition momentum. Michael Bradley’s equalizing goal, with eight minutes left, was proof of his father’s in-game tactical chops. The decision to put Dempsey in a free role meant he was as likely to drop deep into midfield as he was to appear in the box, and when he did, the Slovenians didn’t quite know how to track him. So Dempsey had plenty of time to find Donovan at the midfield stripe, and Donovan in turn had plenty of time to pick Altidore out at the top of the box. With the Slovenian defense keying on Herculez Gomez making the second run, no one was left to watch Bradley, bursting out of midfield, make the third. Altidore smartly headed Donovan’s cross into empty space, letting Bradley run onto it and finish. After Donovan’s “You Could Not Write a Script Like This” finish in the next game against Algeria, the Yanks found themselves facing Ghana once again, this time in the Round of 16. The pain of the previous World Cup was still very fresh and real to about half the players in the U.S. squad, but Bob Bradley’s lineup choices had much more to do with the outcome than any lingering memories of 2006. The error-prone Ricardo Clark started over Maurice Edu at d-mid, and Feilhaber was again relegated to the bench. When the U.S. gave up an early goal nobody was surprised. Bradley again adjusted, as Edu was brought on just after the half hour mark, and Feilhaber at halftime. Dempsey eventually won a penalty, which Donovan converted in the 62nd minute to make it 1–1. But by extra time, the bill for playing from behind three times in four matches finally came due. Central defenders Carlos Bocanegra and Jay DeMerit were gassed, and Ghana finally realized they could skip the American midfield entirely by hitting long balls over the top. Asamoah Gyan scored three minutes into the extra stanza, and there was no U.S. answer. Bradley’s 2010 team was the first to go into a World Cup without Reyna since 1994, yet they managed to hold onto the tempo of each game, if never really control it. Putting Edu at a pure d-mid spot was one of the main reasons: His presence allowed Michael Bradley to play higher, which had both defensive (a one-man high press) and offensive (he’s one of the team’s best finishers and the second best passer in the final third) benefits. It freed Donovan to work exclusively at right midfield, where he’d often find space to send unhindered service into the box, or simply dribble in himself. And with Dempsey crashing the box at odd angles, the structure lent itself to a level of unpredictability that was only betrayed by shoddy finishing. Yet for some reason, after the World Cup, the coach decided to scrap the 4–1–3–1–1 and return to an “empty bucket” midfield, in which there’s no true d-mid. Going with two box-to-box midfielders on a pulley system ended up leaving tons of time and space in front of the central defense, creating the very problem it was supposed to solve. And in the 2011 Gold Cup final against a Mexican team that was only too delighted to combine through the middle, it was suicide. El Tri reversed a 2–0 U.S. lead, taking home a 4–2 win and ending Bob Bradley’s turn at the helm. When Bradley’s U.S. played with a true d-mid, they were very, very good. When they did not, they were roadkill. The ups and downs of Bradley’s tenure are part of the life of a soccer fan. But that’s not what Gulati wanted the life of the U.S. soccer fan to be, and in 2011, he finally got his man. Klinsmann’s star had dimmed after a brief, unhappy stint at Bayern Munich, but he lived in Southern California, was familiar with the U.S. player pool, and had bona fides that were pretty much unquestionable. He also came in with a plan. “You don’t like to react to what other people do,” Klinsmann said in his first interview after being hired, promising to instill a proactive, possession-based game that was modeled on the 4–3–3 sweeping most of Europe. And it’s hard to blame him, especially when his results have varied mostly from “satisfactory” to “spectacular.” There have been two of the latter sort: the first, 1–0 in Genoa over the Italians; the second, a monumental 1–0 win over Mexico at the Azteca, a first for the U.S.
What makes Klinsmann’s set-up different is that he’s throttled back from the openness of the Bob Bradley years, and shied away from the balance of the Arena years. Defensive-minded players crowd the midfield, sending a simple message: “We dare you to beat us from the flanks.” Mexico took that dare, attempting 39 crosses in the 1–0 loss; a year previous in the Gold Cup final against Bradley’s U.S., they’d attempted only 10. Yes, El Tri dominated possession both times, but against Klinsmann’s scheme they didn’t really trouble Tim Howard until the altitude took its toll in the final 10 minutes. Routinely dropping more creative players for a three-man defensive midfield trio — he’s even made it four, on occasion — runs counter to the attacking, expressive soccer Klinsmann has talked about in interviews. It could be that Klinsmann sees the development of the team as a staged process — and he wants to shore up the defense first. Or, it could be that he’s simply committed to choosing players who play in Europe and that doing so creates a defensive-minded roster. Either way, given those personnel choices, and Michael Bradley being played so deep, even more of the creative onus has been placed on Donovan — now working narrower and with less space — and Dempsey, the one player who’s bloomed under Klinsmann. The offense has subsequently sputtered, producing nearly a goal less per game than it had under Arena or Bradley. With this approach there’s a risk the U.S. will lose some of the counterattacking verve that’s been at the heart of every success they’ve had since re-emerging on the national scene. At their best (Germany 2002, Egypt 2009, Slovenia 2010) the U.S. were able to take good teams, crack them open, and make them run toward their own net. While Spain has mastered the world through tika-taka since 2008, their one major stumble came in the 2009 Confederations Cup semifinals to a U.S. team that was better trained (and more naturally inclined) to absorb pressure, not exert it. The 4–3–3 has become so dogmatic that the U.S. U-23 squad — using a much more attacking set-up than the full national team — refused to switch out of it even when they were getting run out of Olympic qualifying by the likes of Canada and El Salvador. Klinsmann, it seemed, was content to sacrifice a chance at the Olympic stage to make a tactical point. The question is whether that’s a point which needs making — and if he’s picking the right guys to make it. This is a different era, though, with a coach who has been tasked specifically to force an evolution. But even if Klinsmann knows what his players need to do to create a new national identity for American soccer, the question remains: Can they do it well?